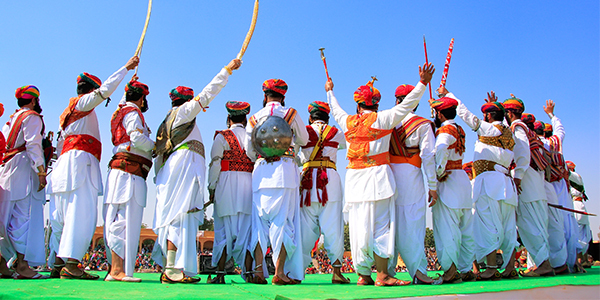 There is no better way to immerse oneself in Rajasthani culture than to attend the Jaisalmer Desert Festival. A three-day annual event, the Desert Festival usually takes place during the month of February in the city of Jaisalmer, Rajasthan. Located in the heart of the Thar Desert, the ‘Golden City’ is recognized for its yellow sandstone architecture, which covers the town in warm hues of sand. According to Hindu Mythology, it is believed that the Lord Krishna told Arjuna, one of the five acknowledged sons of Pandu (an important figure in Hindu text), that one of the successors of the Yadav Community will build his kingdom on the Trikuta Hill. In 1196, Lord Krishna’s prediction came true, when Rawal Jaisal, a descendant of the Yadav clan, set up his kingdom in the Golden city and named the kingdom Jaisalmer. Following the news that the prophecy had come true, people began celebrating all over the kingdom. These celebrations eventually turned into a festival that was organized and celebrated annually. 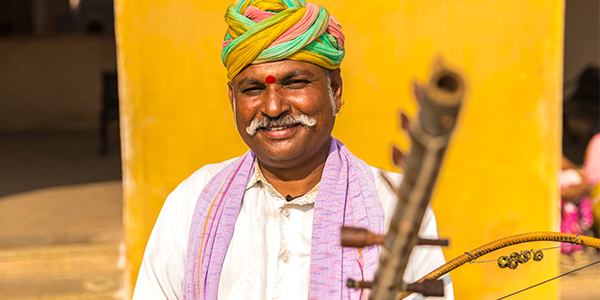 Listen to traditional Rajasthani folk songs that speak about love, bravery, dedication, pride, tradition and history. Dressed in vibrant coloured clothing, watch the locals perform their traditional folk dance. This one of a kind performance will surely make you want to swap your old dance moves for traditional folk dance. Another popular dance is performed by fire dancers, who dance with fire plates on their heads. Not quite impressed? The performance becomes even more exciting when the artists dance on top of the flaming plates. The Desert Festival is well-known for its unique competitions. Watch the Mr. Desert contest, where local men wear their best clothing, turbans, daggers, swords and jewelry. The Miss Moomal competition is a similar contest designed for unmarried women to dress and look their best in front of the large crowd. Other popular competitions include the mustache contest, designed to find the man with the longest mustache, and the turban tying competition, which recognizes those who can tie the best turbans. 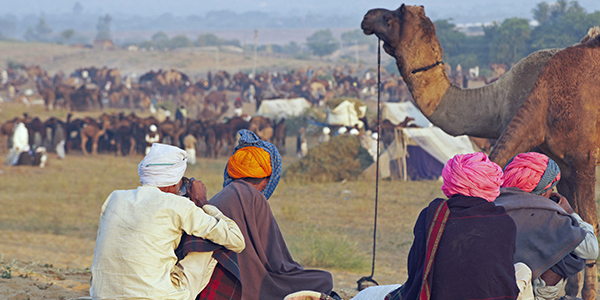 It wouldn’t be a Rajasthani festival if camels weren’t involved. The camels, decorated with flowers and ornaments, enter a competition for the best-dressed camel. There are also camel race competitions, and desert polo, where horses are swapped for camels in a rather unique game of polo. 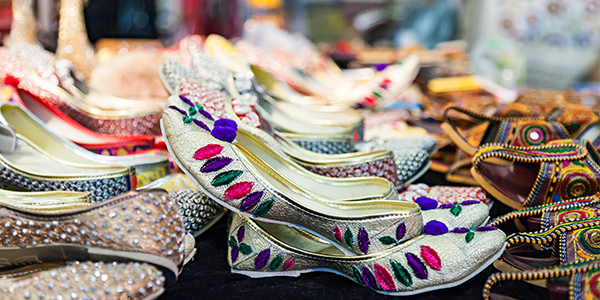 Practice your bargaining skills by purchasing authentic Rajathani crafts, such as embroidered skirts, rugs, hand-woven shawls, leather bags, ethnic silver jewelry, carvings on wood and stone, and more. 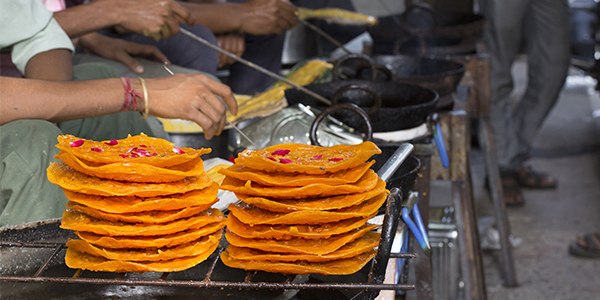 As travel writer, Deborah Cater, once said, “You have to taste a culture to understand it.” The desert festival offers a variety of authentic Rajasthani cuisine to indulge in. Some of the food options include: dal bati, churma, lal maans, ghevar (pictured above) and gaate ki sabzi. The festival comes to an end during the full moon, with a mesmerizing fireworks display. 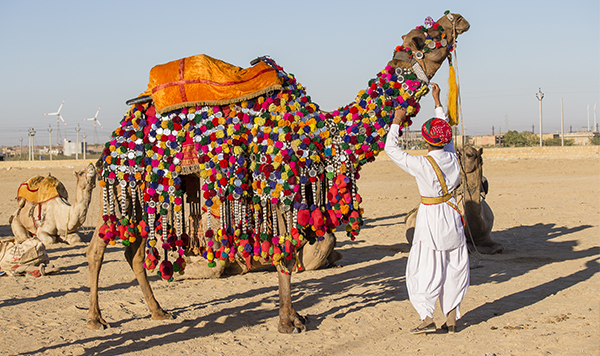 Let us take you to North India to experience the Jaisalmer Desert Festival and more! 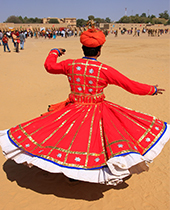 Our Ultimate North India Private Journey includes this experience. 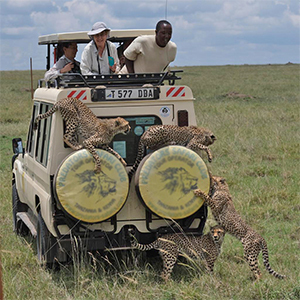 You can request a sample detailed itinerary for this tour by calling 1.800.387.1483 or email Sara with any questions or to discuss your very own Private Journey!